Mevlana Celaddiin-i Rumi is a 13th century Muslim saint and Anatolian mystic known throughout the world for his exquisite poems and words of wisdom. The city of Konya has been known by different names through the ages. Nearly 4000 years ago the Hittites called it Kuwanna, to the Phrygians it was Kowania, to the Romans Iconium and to the Turks, Konya. During Roman times, the city was visited by St. Paul and because of its location on ancient trade routes, it continued to thrive during the Byzantine era. Konyas golden age was in the 12th and 13th centuries when it was the capital of the Seljuk Sultanate of Rum. The Seljuk Turks had ruled a great state encompassing Iran, Iraq and Anatolia. With the decline of the Seljuk state in the early 12th century, different parts of the empire became independent, including the Sultanate of Rum. Between 1150 and 1300, the Sultans of Rum beautified Konya, erecting many lovely buildings and mosques. It was during this period that Rumi came to live in Konya. Mevlana Rumi is generally known in the west simply by the epithet Rumi (which means Anatolian) or in the east as Maulana Rumi. In Turkey he is universally referred to as Mevlana (the Turkish spelling of Maulana – which means ‘Our Master’). Born in 1207 in the town of Balkh in Khurasan (near Mazar-I-Sharif in contemporary Afghanistan), Jalal al-Din Rumi was the son of a brilliant Islamic scholar. At the age of 12, fleeing the Mongol invasion, he and his family went first to Mecca and then settled in the town of Rum in 1228. Rumi was initiated into Sufism by Burhan al-Din, a former pupil of his father’s, under whose tutelage he progressed through the various teachings of the Sufi tradition. After his father’s death in 1231, Rumi studied in Aleppo and Damascus and, returning to Konya in 1240, became a Sufi teacher himself. Within a few years a group of disciples gathered around him, due to his great eloquence, theological knowledge and engaging personality. In 1244 a strange event occurred that was to profoundly change Rumi’s life and give rise to the extraordinary outpouring of poetry for which he is famous today. 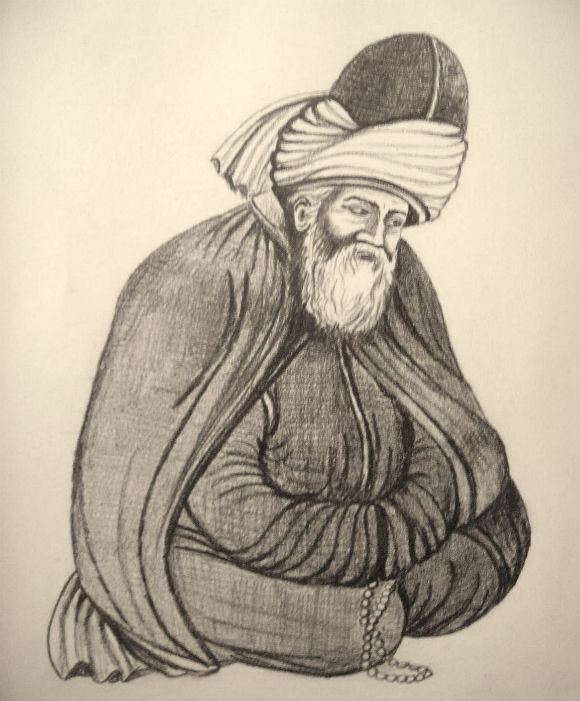 A wandering mystic known as Shams al-Din of Tabriz came to Konya and began to exert a powerful influence on Rumi. For Rumi, the holy man represented the perfect and complete man, the true image of the ‘Divine Beloved’, which he had long been seeking. Despite his own position as a teacher (a Sufi sheikh), Rumi became utterly devoted to Shams al-Din, ignored his own disciples and departed from scholarly studies. Jealous of his influence on their master, a group of Rumi’s own students twice drove the dervish away and finally murdered him in 1247. Overwhelmed by the loss of Shams al-Din, Rumi withdrew from the world to mourn and meditate. During this time he began to manifest an ecstatic love of god that was expressed through sublimely beautiful poetry, listening to devotional music and trance dancing. Rumi is also well known for the Sufi brotherhood he established with its distinctive whirling and circling dance, known as Sema and practiced by the Dervishes. The Sema ceremony, in seven parts, represents the mystical journey of an individual on their ascent through mind and love to union with the divine. Mirroring the revolving nature of existence and all living things, the Sufi dervish turns toward the truth, grows through love, abandons ego, and embraces perfection. Then he returns from this spiritual journey as one who has reached perfection in order to be of love and service to the entire creation. Dressed in long white gowns (the ego’s burial shroud) and wearing high, cone-shaped hats (the ego’s tombstone), the dervish dances for hours at a time. With arms held high, the right hand lifted upward to receive blessings and energy from heaven, the left hand turned downward to bestow these blessing on the earth, and the body spinning from right to left, the dervish revolves around the heart and embraces all of creation with love. The dervishes form a circle, each turning in harmony with the rhythm of the accompanying music as the circle itself moves around, slowly picking up speed and intensity until all collapse in a sort of spiritual exaltation. Rumi passed away on the evening of December 17, 1273, a time traditionally known as his ‘wedding night,’ for he was now completely united with god. In the centuries following Rumi’s death, many hundreds of dervish lodges were established throughout the Ottoman domains in Turkey, Syria and Egypt, and several Ottoman Sultans were Sufis of the Mevlevi order. During the later Ottoman period, the dervishes acquired considerable power in the sultan’s court. With the secularization of Turkey following World War I, the Mevlevi Brotherhood (and many others) were seen as reactionary and dangerous to the new republic, and were therefore banned in 1925. While their properties were confiscated, members of the Mevlevi Brotherhood continued their religious practices in secret until their ecstatic dance were again allowed in 1953. The former monastery of the whirling dervishes of Konya was converted into a museum in 1927. While the dervishes have been banned from using this facility, it functions as both museum and shrine. In its main room (Mevlana Turbesi) may be seen the tomb of Mevlana covered with a large velvet cloth embroidered in gold. Adjacent to Rumi’s burial is that of his father, Baha al-Din Valed, whose sarcophagus stands upright, for legends tell that when Rumi was buried, his father’s tomb “rose and bowed in reverence.” The tombs of Rumi’s son and other Sufi sheikhs are clustered about the shrine. The burials of Rumi, his father and several others are capped with huge turbans, these being symbolic of the spiritual authority of Sufi teachers. The Mevlana Turbesi dates from Seljuk times while the adjoining mosque and the rooms surrounding the shrine were added by Ottoman sultans. Formerly used as quarters for the dervishes, these rooms are now furnished as they would have been during the time of Rumi, with mannequins dressed in period costumes. Within one room there is a casket containing a hair from the beard of Hz.Muhammad. The ‘dance’ of the Whirling Dervishes is called Sema and is a part of the inspiration of Mevlana and has become part of Turkish custom, history, beliefs and culture. Each year on December 17th a religious celebration is held at the site of Rumi’s tomb, to which tens of thousands of pilgrims come. In the shrine there is a silver plated step on which the followers of Mevlana rub their foreheads and place kisses. This area is usually cordoned off but is opened for these devotional actions during the December pilgrimage festivities. In addition to the shrine of Rumi, pilgrims to Konya will visit the shrine of Hazrat Shemsuddin of Tabriz (traditionally visited before the shrine of Rumi), the shrine of Sadreduddin Konevi (a disciple of Hazrat ibn Arabi and a contemporary of Mevlana), the shrine of Yusuf Atesh-Baz Veli, and the shrine of Tavus Baba (who may in fact have been a women and therefore Tavus Ana). Within the museum of Rumi there is a map that shows the location of these various holy sites. We timed our visit to Konya for Saturday night especially to see the Sema Ceremony. The information office told us where it is held (The Cultural Centre) and the time (9pm, but get there by 8.30pm to get a good seat). We sat half way up opposite the orchestra and we had a good view. We visited many semas in Turkey, but this was the most grand in the sense of perspective. The music was excellent and the whirling sublime. The clicking of the photographers behind us with distracting, but the experience was well worth it. For me, the more semas, the better…. Mevlana is the heart of Konya! 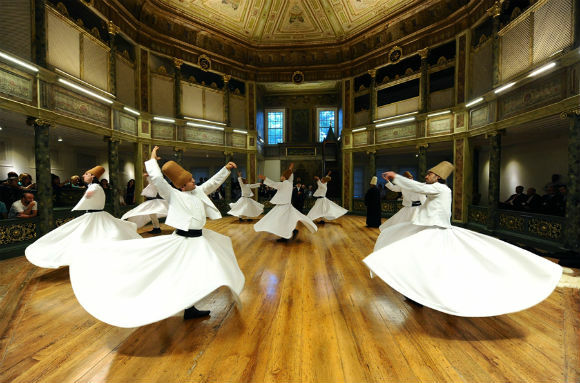 The monks of the Mevlana are taught to twirl as if they are the centre of the universe. The traditional ceremony in Konya is free for all and, like those that witness Tao Chi, is designed to mesermise the viewer into a trance-like, meditative state. Before the whirling starting, just close your eyes and listen to the music. It is taking you to another world. Interesting cultural experience! It was slower that I thought it would be.Sat on hard benches with no backs.